Snack Girl is seriously missing her peaches. Summer seems years away! Recently, I saw one of my best friends feeding her child a "fruit-cup" of peaches. As Snack Girl, I try not to make my friends uncomfortable with comments such as, "WHAT are you feeding YOUR child!". I decided to go to the grocery store and purchase some of these bad-boys for review. 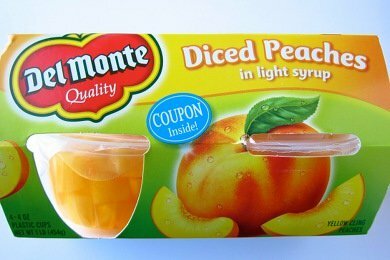 I bought Del Monte diced peaches in light syrup and they cost $2.50 for 4 containers (1 cup each). These tasted pretty good and they did remind me of fresh peaches. But, what about the nutritional information and the ingredients? What exactly am I ingesting? No artificial colors, high fructose corn syrup or nasty preservatives. But, how do they cook them? Are the micro-nutrients destroyed by the processing of the peaches? So, I decided to call Del Monte (there is a phone number on the package) and grill them about these peaches. They informed me that they use a thermal process to preserve the peaches called canning. Ummmm, duh! It seems that my paranoia about the food industry has led me to forget that there is some food processing that is perfectly reasonable. Canned peaches are simply poached. The process is much like cooking or canning at home, except that it’s done on a large scale in a cannery. And there are scientific studies where they compare the nutrient value of canned and fresh produce. Their findings conclude that canned foods are comparable to, and sometimes better than, fresh and frozen varieties see University of Illinois Department of Food Science, 1997. Yes, this study was funded by the canning industry, but two other major studies also confirmed their findings Canning Research - U.C. Davis and University of Massachusetts. Basically, this is an awesome snack. It will quell your sweet craving, give you some nutrients, and (if you are lucky) you will get the feeling of the warm summer sunshine beating down on your body. If I was more hungry, I would add a cheese stick to give me some protein for staying power. These are both simple, packaged snacks to keep in your pantry for the times you are craving junk food. Have you tried canned peaches? We used to eat a lot of canned peaches and pears, but then a study came out from the Environmental Law Foundation-- it turns out that a lot of these canned fruit products, including the peaches sold by Del Monte, contain high levels of lead. They also recently started making these fruit cups in juice rather than syrup. I keep them on hand for my daughter. I drain the juice and she loves eating out of the little cup. I'd like to know more about the lead study; I could have some of my students repeat this on newer samples for a project in my class next year. @kT - So the lead study was new to me until Maxine posted it above. Seems these guys used an EPA approved lab and tested for lead amounts and found them to be higher than 0.5 micrograms of lead per serving (which means in CA that a warning label needs to be put on the package). I called Del Monte and they informed me that they comply with the FDA rules and regulations. So, lead is in the soil because of the use of leaded gas and lead in pesticides in the 50s. The question I have is what about fresh peaches? Are they also lead contaminated or is there something special about canned peaches? My guess would be that all peaches from an orchard that had lead contamination (whether fresh or canned) would have some lead in the peach. Lead doesn't degrade so the contamination could have happened a long time ago. I think I will look into this further and do a post on it because I am now upset by the idea that a snack I advocated has a suspicious amount of lead in it. argh. Del Monte has no sugar added as well in peaches and mandarin oranges. I love that you do real research on your posts! Thanks for your conscientiousness! I really appreciate it! This is silly - but when I look at the nutritional values, it looks like there aren't any! A very small amount of vitamin C, maybe... but nothing else? Does that still make these good for our kids? Thanks for looking into these for us. My kids enjoy these in their lunch boxes. Buyer beware, however, I was appalled to find that some of these little fruit cups now contain artificial sweeteners. I'm not sure which brand, but I check closely now. I would love recipes for one, if possible. Well, if the lead is from contamination and not from can solder, it seems it would be in all peaches in the area...scary but if you're not eating it every day (or eating tuna every day or other sources of heavy metals) I wouldn't be too alarmed. Lisa, I can definitely appreciate your craving for peaches. BUT, the reason I don't like these peaches is that unless they are organic (and they aren't),they are one of the worst offenders when it comes to pesticide use. Conventional peaches require a significant amount of pesticides to grow. And their extremely delicate skin doesn't provide a chemical barrier. As a result, peaches are one of the top fruit picks for organic purchase, especially when feeding young children. As always, there's the affordability issue with organic, but that's another topic all together. Dole just came out with their fruit cups and jars now in 100% fruit juice instead of the light syrup. I think it tastes better and its much healthier! I buy the Del Monte diced peaches sweetened with Splenda. Is Splenda as bad for you as other artificial sweeteners that contain aspartame? Is it healthier to have peaches in syrup or peaches in juice? My instinct says the juice - but that must have quite a bit of sugar too? Canned peaches were, for some reason, one of the three foods my then 2yo daughter (now, healthy 16yo) would eat. We bought those packed in juice (sans added sugar) figuring it was better than nothing! @cinabar - I think it is healthier in juice because it has less added sugar than the light syrup. Great question! these peaches are good but i have noticed that this fruit is grown in china. And also just about every other brand of fruit on the shelf is grown there or in thailand. Shouldnt we be worried about that? This is all confusing to me as i am trying to learn how to eat better. Hi Miranda - I'm a nutritionist with extensive experience in the food industry. I advise my clients not to purchase canned products from China. Plus, these peaches are conventionally grown and subjected to pesticide levels that are much higher than many other fruits. The best way to make this whole process of food selection less confusing is to buy and eat fresh fruits and vegetables that are in season, and grown locally or in the U.S. If you'd like to learn how to eat better, I offer free 15-minute consultations and I'd be happy to help you with any other questions. I really like you Snack-Girl. This article was very informative. I am one of those people who assumes canned foods are banned naturally. Thanks for easing my consciousness.